Breakthroughs typically arise from strange beginnings. In his early years as a student at Harvard, Mark Zuckerberg had no clue that he would forever change the world upon launching the “hot or not” website, FaceMash. The same concepts and software behind Zuckerberg’s sophomoric project would later be applied to the social media platform that now connects over two billion people: Facebook. Yet Zuckerberg’s Facebook and its fellow social media giant, Twitter, never contemplated the true extent of their tremendous influence, especially when their platforms could seemingly be used to shape political outcomes. In the aftermath of the 2016 election of President Donald Trump, a massive “techlash” has ensued against Facebook and Twitter for their role in providing an online platform for Russian social media operatives and Cambridge Analytica programmers to manipulate American voters. Russia’s operations and Cambridge Analytica’s data harvesting of over 87 million Facebook accounts has made it abundantly clear that the U.S. government, online social media companies, and the American electorate were woefully unprepared, if not dangerously oblivious, to the sinister side of the Internet. For far too long, we (this writer included) have assumed that the Internet was an infinite source of plentiful data that would encourage freedom, transparency, and government accountability. We falsely believed that the Internet could only be a force for good across the world; if it could organize pro-democracy protests during the Arab Spring and mobilize financial support for medical research into ALS, what was there to worry about? Plenty. Malicious state actors, unethical private interests, and our own blinding ignorance towards our biases have successfully weaponized the Internet to influence political outcomes in America, and each of these three factors will continue to distort our future elections if serious reform is not considered by the American government, social media platforms, and ourselves. It is undeniably impressive and horrifying that a handful of Russian operatives were able to exercise a considerable amount of sway in U.S. elections for the small price of $100,000. According to Facebook’s Chief Security Officer Alex Stamos, Russian operatives most likely purchased over 3,000 ads from June 2015 to May 2017, littering Facebook with divisive topics such as gun rights, immigration, and race. These operatives were able to piggyback off of Facebook’s targeted algorithms for news sources, amplifying their manipulative agenda; since Facebook’s algorithms promote news sources and political content in line with users’ previous activity, these operatives effectively hijacked and reinforced the online echo chamber, exposing roughly 126 million American Facebook users to Russian-backed content. Twitter has also conceded that more than 50,000 Russia-linked accounts used its service to post material about the 2016 US election, reaching at least 677,775 Americans. What is most disturbing is that Russia shows no sign of stopping; following the tragic Parkland High School Shooting, Russian-linked Twitter bots promoted conspiracy theories and gun rights advocacy in an effort to further corrode trust between Americans. There is no doubt that these online affronts from state actors will continue. 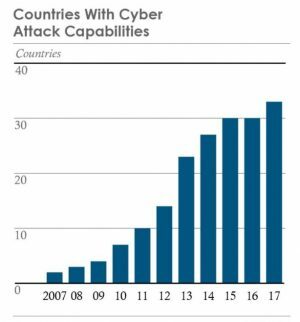 According to the Worldwide Threat Assessment Report from the National Director of Intelligence, the number of countries with cyberattack capabilities is expected to increase dramatically in the coming years. Russia, China, Iran, and North Korea, the greatest threats to America’s cybersecurity, will further enhance their cyber operations as a low-cost tool of statecraft to achieve strategic objectives unless they face clear repercussions for their online threats. Yet none of these online challenges from state actors are new; North Korea and China alike have each perpetrated cyber attacks against the U.S. and its allies, and Russian twitter bots were found culpable of supporting France’s Marine Le Pen, a pro-Russian candidate, and the far right party of Germany, Alternative for Germany, shortly after the U.S. election. America’s government agencies have long underestimated these threats, but social media companies have also turned a blind eye to the growing influence of unethical behavior on their platform. The influence of Russian meddling on the 2016 election remains a bitter point of contention between Republicans and Democrats, but the recent revelations surrounding Cambridge Analytica’s collection of psychographic profiles of American Facebook users has resulted in the bipartisan condemnation of Facebook and its negligence regarding user privacy. Mark Zuckerberg, swimming in hot water, managed to handle his recent congressional testimony appearance with poise, but many users are increasingly concerned about how Facebook shares their personal data with online advertisers and companies. Greater policing efforts and transparency are needed from Facebook, but given the gigantic number of accounts and advertisers on Facebook and the impossibility of screening every post and application, it is even more necessary that users themselves be willing to critique and research the online content that they readily digest from social media platforms. The 2016 election was an odd, polarizing, and divisive election that mirrored the polarized media landscape; one only needs to look to their Facebook newsfeed. What is eerie about the polarized media landscape is the expanding use of social media as a news source. According to the Pew Research Center, about a quarter of all U.S. adults (26%) get news from two or more social media sites, up from 15% in 2013 and 18% in 2016, and just under half (45%) of U.S. adults use Facebook for news. Half of Facebook’s news users get news from that social media site alone, with just one-in-five relying on three or more sites for news. This spells trouble. Facebook has repeatedly demonstrated its inability for monitoring content, as made clear after Russian operatives and Cambridge Analytica programmers manipulated Facebook’s platform for their own interests. But given the immense number of online accounts, we, the American public, have to be far more critical of online information. Greater transparency, such as software recently designed by two Berkeley students to monitor and identify bot accounts on Twitter, and regulation by social media companies, such as Facebook’s new updates that strengthen privacy settings, are valid ideas. But as citizens and voters, we, the American people, also bear a responsibility to check our sources of information and expose ourselves to differing views. Spending less time on social media sites for news might be a smart place to start, but when we jump into our online worlds, it is best to recognize that the Internet serves as a virtuous tool for some and a destructive weapon for others. Alex is a writer for the United States section of the BPR and is currently studying Political Science with an interest in history. He also enjoys learning crazy facts about Astronomy and windsurfing in the Berkeley Marina.